This year I was determined to decorate my home before the season began and I actually did it! This is my front door swag and my Christmas tree. I always place my tree in a garden urn to make it taller in my entry. Fortunately I have a willing hubby who rigged this up for me to make it easy each year. He actually screwed the Christmas tree base into the top of the urn for easy installation. I love admiring the ornaments my kids have made throughout the year. I also have a collection of crystal ornaments that sparkle beautifully! Each year I frame a photo of our family representing a significant event from that year. It's so much fun to go back and look at each one and reminisce. Last year we were at Disney and it was a Christmas of a lifetime. It's fun to see our photo hanging on the tree. My birdies always get their berry wreaths on their tails each year. I love placing ornaments throughout my home, especially in my entry arrangement. I filled my bowl on my dining room table with all my favorite large ornaments. The gold deer is a new addition this year. My cabinet in my kitchen got all decked out too with oversized ornaments, large pinecones and birds. I did it in about 4 hours and said a sigh of relief when it was done! Especially since about 1/2 our lights weren't working and had to be replaced. One of the tapestries I purchased in Paris even got a touch of sparkle. My bust got a swig of pine too! After I finished MY HOME, I was off to do our Church decorating. Deck the Halls is literally what we did all day a few weeks ago. I recruited about 7 teenagers that willingly decorated their fingers to death! We had some fantastic lady volunteers that joined us too! Didn't they do an amazing job on the tree? This was at the end of the day so you can see the exhaustion written all over our faces. I just love the fireplace in our lobby! You feel like you are in a mountain lodge! Now that it is all decked out with sparkly icicles and snow covered garland it is even more fantastic! 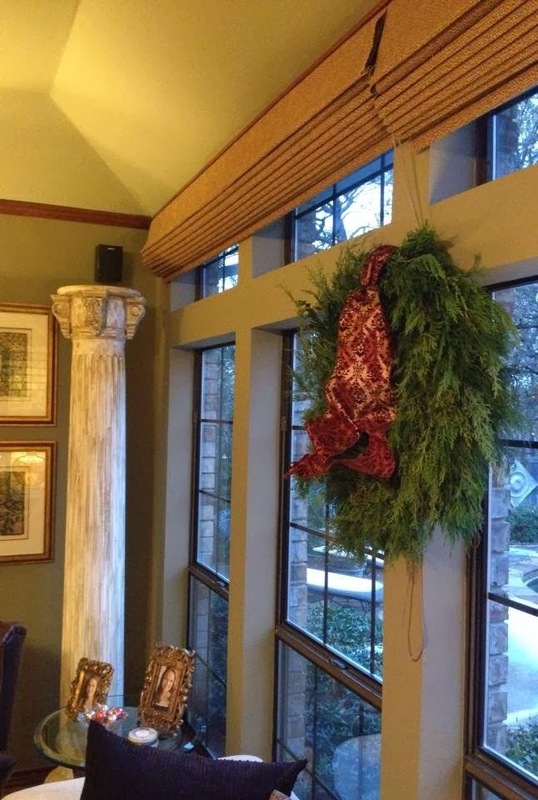 My hubby and his friend spent a few hours on this lift fluffing wreaths and swags! That's dedication! They actually have a little "decorator" in them - Shh don't tell them I said that. They also took great instruction as I yelled and pointed from below. I found these great big ornaments this year and they look amazing on the rustic mantel! The stockings were made last year by a grandma in the church. I gave her a blanket I loved and asked her to make great big stockings out of it. She added black velvet to the top of each one and they look fantastic on this huge mantel. My philosophy behind good Christmas decorating is to have large items and fewer of them. Big ornaments always make a tree look fantastic! A fresh wreath is hung in my living room and smells divine. Just hope it lasts till Christmas. We also decorated a business lobby a couple weeks ago. Lots of work but so rewarding to see the finished product. Such gorgeous colors to match their corporate banners in their waiting area in the lobby. I've been extremely busy the past few weeks and am looking forward to some down time this holiday season. I've been enjoying my Christmas mugs each morning when I do my quite time by the fire. Hope you are enjoying your season! One more week and it's time to "check out" for a while!